- Tables will be held 15 minutes and released to general seating unless restaurant is able to accommodate the reservation. when you eat here your mostly paying for the experience, it takes going to a baseball game to to an entire new level. That being said the food was ok for what you pay. If I payed that much for ONLY the food I would have been disappointed, But the experience made it all worth it. As always our experience was outstanding. Janice was our server and she was very efficient and friendly. Food is a little over-priced but the experience is great. My Wife And I Have Been Their Once Before So We Desisted To Do It Again The Food Was Better The First Time, However We Still Enjoyed Our Time There. Looking Forward To The Next Season. Our server, Janice, was wonderful. She was attentive, personable and make the experience a great one. I'm not sure the $50 buffet was worth the price, but the experience of watching the game from the patio was worth the price. Service and food was great across the board. Very attentive and friendly staff. Definitely coming back!! First time at the Lexus Diamond Club and had a really great experience. Janice, our waitress was outstanding! Couldn't agree on how big a tip! We would never eat here again. We have eaten in other ballpark dining and were satisfied. The food selection was poor and the service was even worse. I was hoping I would be asked to review the Lexus Diamond Club restaurant at Angel Stadium. Will not be back! My husband ordered drinks, 3 came, mine did not. The waitress said they were looking for a glass to wash to serve it in. When it finally came it was a 3/4 pour and in a plastic cup with sugar on the rim of the cup. Then to dinner, told we could not order off menu it was only buffet, however if we wanted we could order the "bar" food but only if the other 3 in our party went to the buffet (there were 4 in our party). The food was decent, I will say, but continually waiting for plates to be replenished, empty platters, the line for the burgers was at least a dozen deep of patrons, desserts were not plentiful and not all selections on the list were available. For the cost, which was well over $300 for 4 people (dinner for 4 and 1 drink, and 6 beers) not worth the hype or high cost. WILL NOT GO BACK AGAIN!! Our hostess was awful, people serving food extreme curt. So sad!!!! Our waiter Mark was great and his big personality made up for just about everything else going wrong. Even the hot dog buns were stale and they ran out of condiments and told me they would not refill them! $600 on baseball tickets plus $400 on brunch and they wouldn’t refill my onions! Beyond disappointed! Food was outstanding! Janice our server ,went out of her way to be kind and helpful. Another great meal at the stadium. The quality of food in the Diamond Club restaurant is so much higher than concession stand food and I find that the price difference is worth it to eat healthier. When I order food from my seats my bill usually ends up not that much less than eating in the Diamond Club restaurant and the difference in quality of food is like night and day. Diamond Club has become the location for sports dining. There is none better. Whenever possible we like taking friends to the Lexus Diamond Club, it is such an enjoyable experience with food selections for everyone. Our friends and family are always so impressed with the service and the food. Loved the experience. Very relaxing and the food was exceptional. The food was great and our server, Janice, was awesome. We would recommend the Lexus Diamond Club Restaurant to anyone wanting the ultimate experience of seeing a game up front and enjoying a good meal. An incredible first time experience to see the Anaheim Angels-Los Angeles Dodgers game for a surprise anniversary treat for my husband. I made reservations at the Lexus Diamond Club Restaurant at Angel Stadium another first but certainly not the last. Everyone from the hostess Briana and there was another young beautiful woman who were extremely accommodating as they seated us right at the window behind home plate. It didn’t stop there we then had the best server ever, Jessica who must have come down from the heavens, sweet, kind, efficient and extremely attentive. Jessie who was Jessica’s assistant was also making sure everything was going well. The restaurant has a buffet but you are able to order additional items off the menu. We chose to order their tenderloin that first came to us not cooked the way we requested. No big deal to us we were just enjoying this incredible day. Within moments a manager, James came to our table to apologize, we were shocked at how quickly they responded to something we didn’t think was anything. James made sure we were taken care as he offered many different options to accommodate what happen. 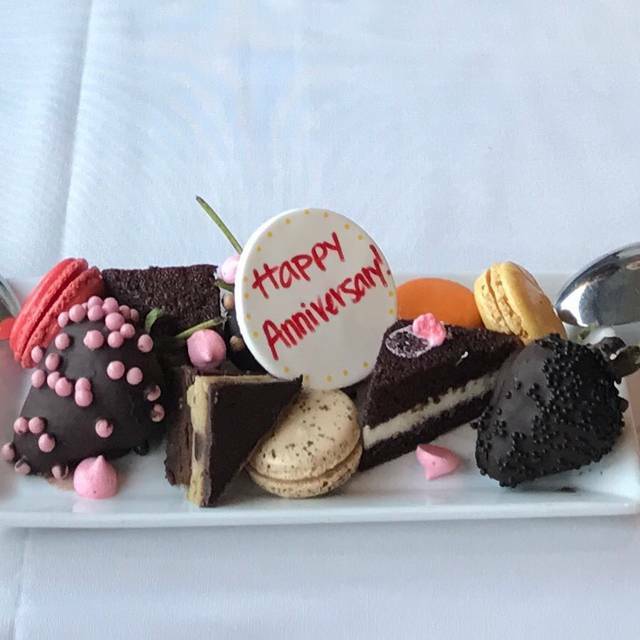 At the end of our meal Jessica brought out a plate of desserts with a Happy Anniversary marzipan medallion in the middle. This was a wonderful sweet treat for sure, we thank each and every one of them for making our day so special!! Bree was very helpful and friendly. Very pleased with everything. Food was excellent and our server Janice was great. Will definitely go many more times. This is a great place to eat once in a while, if you get the chance. You have to have Diamond Club tickets, so access is limited. The buffet is expensive, but really no need to upgrade to an entree since there is a lot of variety, and you won't go away hungry. The second seating means you miss the first few innings live, but here are lots of screens to keep you informed about the game. We were there on a Friday night, so we expected a big crowd, but we were seated right away, and had no problems navigating all the buffet stations. Excellent food! Very fresh and well-stocked. Friendly staff, and our water glasses were kept filled, and empty plates quickly removed. This is a great idea for a special occasion or for baseball fans who have never experienced it. The minimum charge is $50 per person (plus tax and tip): not an every day budget item for us, but worth the splurge! Loved that they chxnged up the menu from last season. Food was tasty last year but this year new items were a home run for our group. The mini pancakes was one of my favorites. The salted caramel gelato was grand slam. 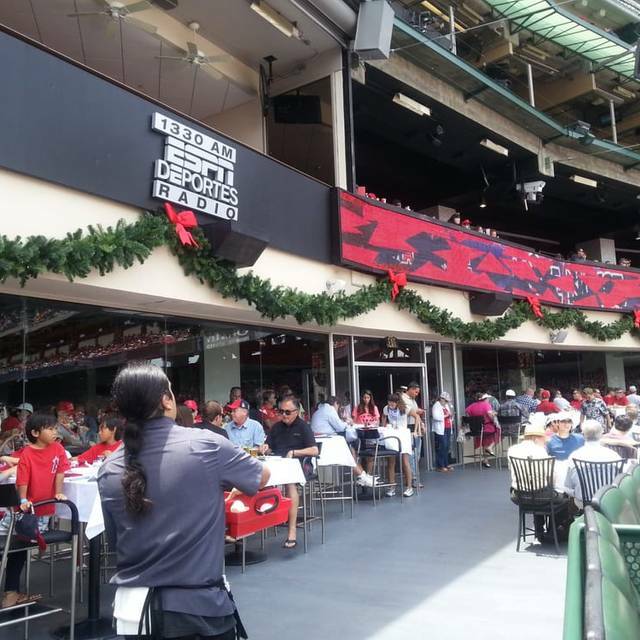 If you’ve never experienced the Diamond Club experience, it’s a must for the true angel fan. Great food, seats and ambiance! Not a bad way to watch a ball game. Had good drinks and a very good assortment of foods to chose from. This was the first time and last time I'll eat at the Lexus Diamond Club. The food was good but over priced. The waitress was almost invisible we only saw her three times first when we were seated then after we finished eating she came over and asked if we wanted coffee. then when she brought the bill. The straw that broke the camels back was when I got the bill the coffee was an additional $5.00 each. I think that when it costs $50.00 for a buffet lunch it is almost a crime to charge and extra $5.00 for a cup of coffee. Awesome. This place never disappoints. Food and service were great! Next time we will make sure we sit outside. I don’t think we would want to sit inside again. The reservation didn’t tell me it was inside until I was done making the reservation. This was our first turn there so I didn’t realize how it worked, but now I know for next time. Went before the game, couldn’t see the field, way expensive for a buffet of bar food. Won’t do it again ever. Took the kids for the first time-hoping they'd like the buffet and the desert cart. Food was bad, couldnt even finish most of it; it was like the bratwurst were better at the concession stands. The food was dry and just unappealling. Then hoping the deserts would at least make up for it. Lime, Coconut, and a few other really bad gellato flavors. No chocolate? No Vanilla? $300 meal that I wouldnt pay $50 for in the future. Sorry Diamond club, you used to be really good-but I think we are going elsewhere to eat before the game from now on. Judging by the amount of empty tables I think others have also had the same experience and are choosing not to go back. Just a horrible menu and bad food. Service was however great-they fortunately have the same servers who are always pleasant and kind and make up for the awful food. Get a new person in charge of what you serve or you are going to see a lot of empty seats in the future. Glad they no longer require that an entrée be purchased as the small plates were fine all on their own. The food was ok but not great. The price was high for the quality of the food. I likely won't eat there very often as I can spend a lot less at the concessions near by (still not a great deal bur definitely better value). could not find utensils for the deserts.